Halley McVeigh (from left), Emilee Ennis, and Jeff Augur on the Mook Sea Farm's oyster growers. In our special series “Aquaculture’s Next Wave,” we’re looking at new technologies and farming techniques that are expanding the industry’s potential in Maine. In this installment, the state of the oyster-growing industry, and novel attempts to protect the harvest against the effects of climate change — or even take advantage of them. On a cove out on the eastern side Casco Bay’s Chebeague Island, a receding tide reveals dozens of wire cages. They rest akimbo on the sand and sparkle in the sun. For island native Jeff Putnam, they hold treasure inside — bags and bags of young oysters. “This one here is probably two years old I’d guess, looking at the shell, you can see the first-year growth and then all this fingernail-looking growth on the end is from this year,” he says. Putnam’s main business is lobstering, same as it was for his father. But this winter his boat will do double duty, hauling tens of thousands of the first harvest of mature Sandy Point oysters to market, at 70 cents or so apiece. For Putnam, it’s not just about diversifying his revenue streams. It’s about a future on the island for his three young children. “Hopefully the lobster resource will be strong when they grow up. But there’s certainly no guarantee that’s the case. So I want to show them and other kids there is another way to make a living,” he says. As with many lobstermen, Putnam is reluctant to weigh in on climate change. But over the years, he’s witnessed the gradual warming of these waters, and the collapse of lobster fisheries in Long Island Sound and off Massachusetts. It’s a warning: The lobster boom could bust. Jeff Putnam, a Chebeague Island lobsterman who’s developing a side line in oysters. He says he wants to make sure his kids can make a living on the island, even if the state’s lobster boom falls off. “And with the oyster stuff seeming to do well with these warmer waters, that seemed a natural fit. I didn’t base my decision off a Time magazine article or something. I looked at real-world what’s going on, what can I do to support my family and stay on this island that I love,” he says. But the oyster industry, too, is at risk from the effects of climate change. “There is real money at stake and it’s already costing us,” says Bill Mook, one of Maine’s most prolific oyster farmers. 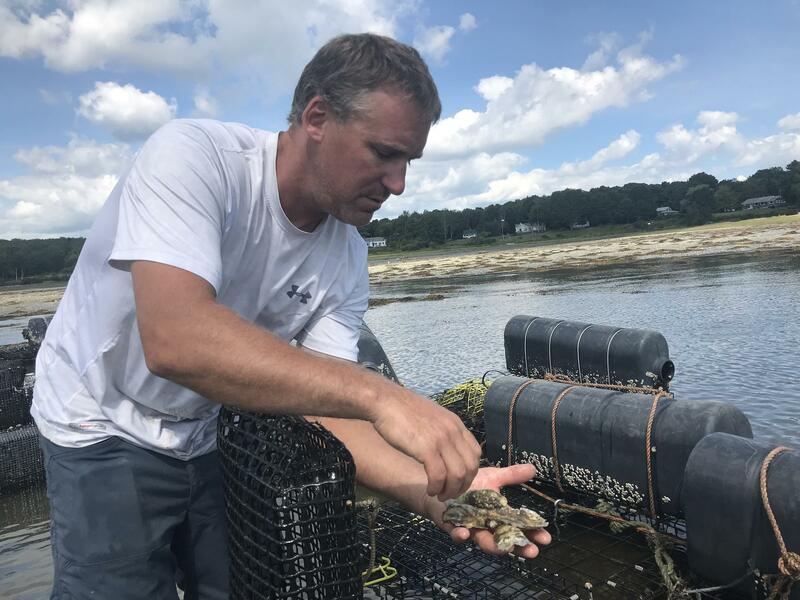 Mook and his employees harvest millions of oysters a year from a fertile estuary in the Damariscotta River, where production roughly tripled over the last decade. But Mook says there’s a rising problem — more frequent and more intense rain events, driven by climate change, can send polluted runoff into the river. And in response, the state closes down the harvest. “We did have three in a row over two months. So cumulatively that’s about $30,000 in lost sales,” he says. Climate change is bringing other challenges. Ocean acidification, which affects shell development, for one. And potential outbreaks of vibrio, a bacteria that can be quite toxic for humans who eat contaminated oysters. It has been moving north as warmer waters and air temperatures encourage its growth. For toxins — and rain closures, too — Mook has a solution. “So this room will hold a half a million oysters, when it’s up and fully running,” he says. Mook is just now finishing out a $2 million, 9,000-square-foot facility he designed expressly to defend the farm’s crop against climate change — and maybe get a leg up on his competitors. Bill Mook and vessels filled with the microalgae he uses to feed baby oysters at different developmental stages. He’s pioneered another technique that encourages phytoplankton growth — in the dark, saving on energy bills and reducing carbon dioxide emissions. In a cavernous room, 4-foot by 4-foot tanks laden with mature oysters are stacked high in the air. Seawater that’s UV-purified and temperature-controlled flows from ceiling pipes down through the stacks. Underneath the floor, turbines power away the wastewater, to be skimmed and recirculated. “Basically keeps anything from settling in the tank so all the oyster poop and any grit or anything, just keeps it up in the water,” Mook says. Late last month, Mook and his staff hustled tens of thousands of mature oysters out of the river and into the facility, ahead of heavy rains expected in the aftermath of Hurricane Florence. When the state put neighboring farms’ river oysters off-limits, Mook Sea Farm was able to harvest them straight from the facility and get them to market. Down the line, if vibrio shuts down the Damariscotta’s oysters for an extended period, Mook says he’ll decontaminate them here. He’ll need FDA approval for that — but he believes he’ll get it. 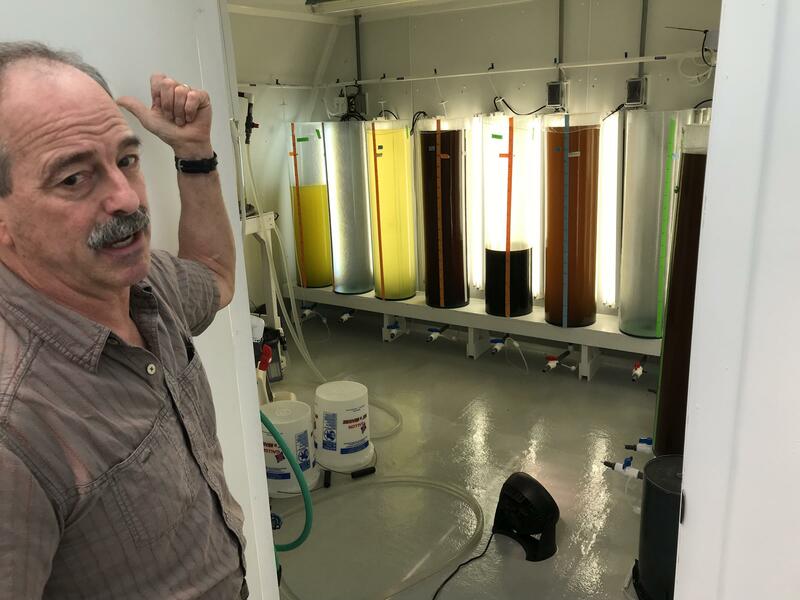 Bill Mook and one of the big oyster tanks in a $2 million facility he’s built to help protect his harvests against climate change-driven threats, such as polluted runoff and a toxic bacteria called vibrio. “Climate change is costing us, and yet it also offers some opportunities that will allow us to be resilient and sustain this business and the people I’ve begun to employ into the future,” he says. People like Jeff Augur, the farm’s river foreman. He’s one of the 20 or so young workers Mook has added through his expansion over the last five years. Augur trained to be a lawyer, but he says says aquaculture innovations are proving to be a magnet for him and other young Mainers. “At the end of the day you go out to the bar and you see other young professionals that are on oyster farms. And for communities and areas like this that are kind of struggling, I think it’s the answer,” he says. Mook says he can envision a day when climate change forces Maine oysters to be hatched and grown entirely indoors, never touching the wild river. But, he adds, that would be a very sad day. 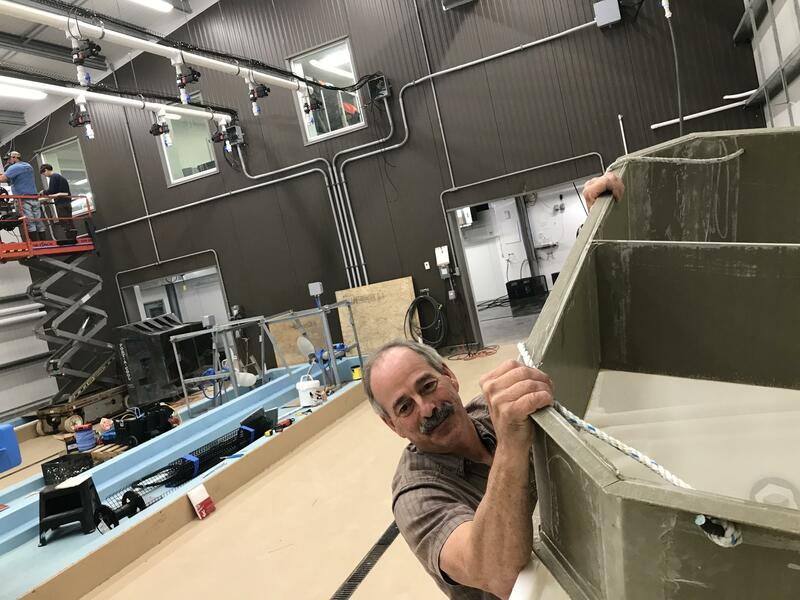 In the course of reporting our recent series "Aquaculture's Next Wave," Maine Public reporter Fred Bever conducted myriad research and interviews, much of which fell to the editing room floor.